A fundamental teaching of the LDS Church is that the priesthood given to its worthy men embodies a special authority to act in God's name. This divine authority also invests priesthood holders with the sacred duty to restore and operate Christ's church upon the earth. Latter-day Saints believe that in two separate, miraculous events, Joseph Smith and Oliver Cowdery were given the keys to this ancient authority when they were visited first by John the Baptist who restored the Aaronic Priesthood, and later, by the Apostles Peter, James, and John who restored the Melchizedek Priesthood. This priesthood gave them the authority to lead others in the restoration of Christ's church on earth. With the restoration of the sacred priesthoods conferred upon Joseph Smith and Oliver Cowdery, the true Church of Jesus Christ could once again thrive on earth. Today, all worthy Latter-day Saint males 12 and older can be ordained to the priesthood. In deference to their sacred duties, Latter-day Saint priesthood holders direct the affairs of the church, proclaim the gospel of Christ, ordain other brethren to the priesthood, and officiate the ordinances of salvation for both the living and the dead. Researchers who have closely examined the D&C and primary source accounts found that the official narrative of priesthood restoration contains numerous gaps, inconsistencies, and contradictions. Scholars also raise important questions that expose potential weaknesses in Smith and Cowdery's story of their miraculous ordinations. For example, if Joseph and Oliver had experienced events as remarkable and life-altering as divine visitations by John the Baptist and three of Christ's apostles, why would they not tell others? These miraculous ordinations were not publicly revealed or documented until five years after they supposedly occurred. Moreover, if the restoration of the priesthood is a fundamental tenet of the LDS Church, why was this revelation excluded from the Book of Commandments when it was originally published in 1833, only revealed in the revised and re-named Doctrine and Covenants in 1835? D&C 13. Link is here. D&C 27:12-13. Link is here. "Priesthood," Gospel Topics. Link is here. MormonThink's summary of problems. Link is here. Per Joseph Smith-History (1838), the Church's unique right to act in the name of God and perform ordinances necessary for salvation was contingent upon a literal bestowal of priesthood power and authority by resurrected beings who had received and exercised that authority themselves anciently, prior to the universal Apostasy. Joseph Smith claimed he was told in the First Vision that all other creeds were "an abomination," that their professors were "all corrupt …teach[ing] for doctrine the commandments of men, having a form of godliness but deny[ing] the power thereof," and that he was to join none of them. He was later told by the angel Moroni that "God had a work for [him] to do" and that he would have the priesthood revealed to him (Joseph Smith—History 1: 19, 33, 38-39). While translating the Book of Mormon in May 1829, Joseph and Oliver Cowdery pondered on the Savior's command to the Nephites concerning baptism. They decided to go into the woods to pray about the matter. There, they received the visit of John the Baptist, now a heavenly resurrected being. He ordained them by the laying on of hands, conferring upon them the Aaronic Priesthood which "holds the keys of the ministering of angels, and of the gospel of repentance, and of baptism by immersion for the remission of sins" (D & C 13:1). He also promised that they would soon receive the higher priesthood (heading to D & C 13). On the banks of the Susquehanna River, sometime shortly thereafter, Joseph and Oliver were visited by three more heavenly, resurrected beings: Peter, James, and John, who laid their hands upon them to ordain them to the higher, Melchizedek Priesthood and to call them as apostles and "especial witnesses" (D & C 27: 12). With the restoration of these sacred priesthoods, the Church of Jesus Christ could again be organized upon the earth after its long period of apostasy, which organization took place on April 6, 1830. Our latter-day prophets and apostles hold the keys of these priesthoods, which encompass the authority and power of God given to man. With them, they direct the affairs of the church, reveal and proclaim the true gospel of Christ, ordain other brethren to the priesthood and officiate the ordinances of salvation for both the living and the dead. None of the bulleted points mentioned above happened in the earliest days of the church.Joseph Smith and Oliver Cowdery's theology at the time did not encompass the need for a literal bestowal/restoration of priesthood power by resurrected beings in order for church elders to be called and ordained to preach repentance, baptism for the remission of sins, and the endowment of spiritual gifts by the Holy Spirit. Only around the time of a credibility crisis in 1834 did the men begin to speak of a special, miraculous conferral of authority upon them by apostles of old, which they claimed had happened prior to the organization of the church. As pro-LDS historian Richard Bushman admits in his landmark biography on Joseph Smith (Rough Stone Rolling, 75): "the late appearance of these accounts raises the possibility of later fabrication"—even though he doesn't draw that conclusion himself. Many do raise that possibility, however. In a nutshell, they believe that there are good reasons to doubt that the restoration of the priesthood actually happened in the church, despite Joseph Smith's later descriptions of the events in his 1838 History of the Church. The actuality of those angelic events and the exclusivity of power/authority which such events would denote, are highly questionable. "Did Joseph Smith Possess the Proper Priesthood Authority to Restore Christ's Church in 1830?" Joseph Smith and Oliver Cowdery failed to testify to the members nor record anything about the appearances of "John the Baptist" and "Peter, James, and John" in any publications prior to 1834 (five years after the events purportedly took place)—nor did they teach that men ordained to offices in the church were receiving "priesthood authority". Joseph Smith and Oliver Cowdery changed the wording of earlier revelations when they compiled the 1835 D&C, adding verses about the appearances of John the Baptist and Peter, James, and John AS IF those appearances were mentioned in the earlier revelations, which they weren't. The Book of Commandments, which later became the D&C says nothing about these appearances. 1. Joseph Smith and Oliver Cowdery failed to testify to the members nor record anything about the appearances of "John the Baptist" and "Peter, James, and John" in any publications prior to 1834 (five years after the events purportedly took place)—nor did they teach that men ordained to offices in the church were receiving "priesthood authority". The church's current canonical accounts of the restoration of the Aaronic Priesthood (D&C 13, JS-H 1:68-71) and allusion to the visit of Peter, James, and John (D&C 27:12) did not exist in 1833. That year, the church compiled and had printed the earliest precursor to the Doctrine and Covenants, the Book of Commandments, which was the church's second book of canonized scripture following the publication of The Book of Mormon. It was a compilation of all of the recorded revelations of Joseph Smith up through that time, listed in chronological order save for Chapter I (dated 11 November 1831), which was to become the preface for the book, per the revelation itself. Were the restoration of the Aaronic Priesthood under the hand of John the Baptist recorded in the church prior to 1833, it would have appeared in the Book of Commandments somewhere between Chapter IX and Chapter XII (based on the currently named date of 15 May 1829). It's not there, nor anywhere in the BofC. Were the restoration of the Melchizedek Priesthood under the hand of Peter, James, and John recorded prior to 1833, it would have appeared somewhere between Chapter XII and Chapter XVII (the first of the revelations recorded on the day of the church's organization, April 6, 1830). It's not there, nor anywhere in the BofC. I never heard that an Angel had ordained Joseph and Oliver to the Aaronic Priesthood until the year 1834[,] 5. or 6—in Ohio.… I do not believe that John the Baptist ever ordained Joseph and Oliver… (Whitmer, quoted in Early Mormon Documents, ed. Dan Vogel, 5:137). In August, 1829, we began to preach the gospel of Christ.The following six elders had then been ordained: Joseph Smith, Oliver Cowder, Peter Whitmer, Samuel H. Smith, Hyrum Smith and myself …We preached, baptized and confirmed members into the Church of Christ, from August, 1829, until April 6th, 1830, being eight months in which time we had proceeded rightly; the offices in the church being Elders, Priests and Teachers …We were as fully organized—spiritually—before April 6th as were on that day ….In no place in the word of God does it say that an Elder is after the order of Melchisedec, or after the order of the Melchisedec Priesthood.An Elder is after the order of Christ.This matter of "priesthood," since the days of Sydney Rigdon, has been the great hobby and stumbling-block of the Latter Day Saints.Priesthood means authority; and authority is the word we should use.I do not think the word priesthoodis mentioned in the New Covenant of the Book of Mormon.Authority is the word we used for the first two years in the church—until Sydney Rigdon's days in Ohio. I joined the church in 1831. For years I never heard of John the Baptist ordaining Joseph and Oliver. I heard not of James, Peter, and John doing so …[A]s to the story of John, the Baptist ordaining Joseph and Oliver on the day they were baptized; I never heard of it in the church for years, altho I carefully noticed things that were said (McLellin, quoted in Grant Palmer, An Insider's View of Mormon Origins, pp.224-25). The early revelations of the church set no precedence for one's need for "priesthood authority" in order to be called of God, ordained (accredited) to an ecclesiastical position within the church, engaged in the work of preaching repentance and baptizing for the remission of sins, nor to ordain (set apart/accredit) others within the church. Book of Commandments 3 states, "If ye have desires to serve God, ye are called to the work …and faith, hope, charity, and love, with an eye single to the glory of God, qualifies him for the work" (D&C 4).No priesthood requirement mentioned!Book of Commandments 24 states that salvation could come to those who "would believe . . .in the gifts and callings of God, by the Holy Ghost, which beareth record of the Father and of the Son …Every elder, priest, teacher or deacon, is to be ordained according to the gifts and callings of God unto him, by the power of the Holy Ghost which is in the one who ordains him" (D&C 20, emphasis added)—which emphasizes an individual's spiritual gifts, the calling that comes from God himself, and the Holy Ghost (not priesthood) in the one who ordains which would stipulate the gifts of the individual. 27 Yea, even twelve; and the Twelve shall be my disciples, and they shall take upon them my name; and the Twelve are they who shall desire to take upon them my name with full purpose of heart. 28 And if they desire to take upon them my name with full purpose of heart, they are called to go into all the world to preach my gospel unto every creature. 29 And they are they who are ordained of me to baptize in my name, according to that which is written . . .
31 And now I speak unto you, the Twelve—Behold, my grace is sufficient for you; you must walk uprightly before me and sin not. 33 And I, Jesus Christ, your Lord and your God, have spoken it . . .
38 And by their desires and their works you shall know them. The Twelve were ordained (called) of Christ himself to baptize in his name and to preach the gospel with the "power of the Holy Ghost" (which was already in them—not conferred via ordination, nor received via the laying on of hands for the gift of the holy ghost).Again there is no mention of requisite "priesthood authority," even for the Twelve Disciples. 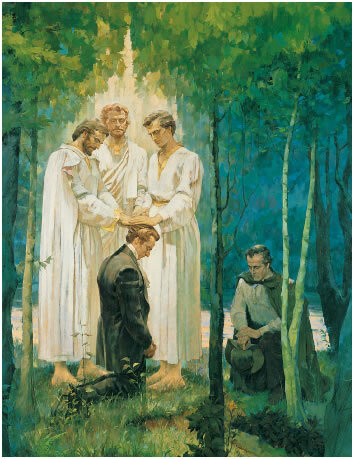 "One morning …[Joseph and Oliver were translating in Third Nephi in the Book of Mormon] the first thing that presented itself to Joseph was a commandment from God that he and Oliver should repair to the water & each of them be baptized.They immediately went down to the susquehana (sic) river and obeyed the mandate given them . . .They had now received authority to baptize" (quoted in Grant Palmer, "An Insider's View of Mormon Origins", pp. 215-216). As Grant Palmer has noted, "Accounts of angelic ordinations from John the Baptist and Peter, James, and John are in none of the journals, diaries, letters, or printed matter until the mid-1830s" (Grant Palmer, "An Insider's View of Mormon Origins", pp. 223-224). Joseph and Oliver's delay in mentioning the restoration of the priesthood is confusing in light of the emphasis the church places on those events today. Modern church documents purport that the restoration of the two priesthoods were necessary prerequisites for Joseph to organize the Church of Jesus Christ again in these latter days: "With this authority [conferred by the ancient apostles], the Prophet Joseph Smith was able to organize the Church of Jesus Christ in this dispensation and begin to" establish the various priesthood quorums as they are known in the Church today " (Our Heritage) . If Christ's resurrected apostles appeared to Joseph Smith and Oliver Cowdery in 1829 with the express purpose of authorizing them preparatory to the restoration of the true Church of Christ again on the earth, why didn't Joseph and Oliver mention these angels and their authority on the historic day of the Church's organization (April 6, 1830)? Why did they wait 5 years before mentioning these ancient apostles? If Joseph and Oliver did not claim at first to have received their divine appointments from resurrected apostles, how did they convince early converts that they were indeed authorized to preach, baptize, and, ultimately, to organize a new Christian church? Would Jesus have bothered to send Peter, James, and John and John the Baptist if a conferral of the "priesthood" was irrelevant (unnecessary) to the Work, as early revelations suggest? 2. Nobody in or out of the church knows the exact date of the restoration of the Melchizedek Priesthood, and Oliver Cowdery was inconsistent in describing who had come to confer that authority. B. H. Robert, faithful Church historian, admitted in 1902: "…there is no definite account of the [Melchizedek Priesthood restoration] event in the history of the Prophet Joseph, or, for matter of that, in any of our annals…" (History of the Church, Vol. 1, p. 40 footnote)Joseph Smith and Oliver Cowdery never pinpointed the date of the appearance of Peter, James, and John, making instead generalized statements about the locale (by the Susquehanna River) and the timing/circumstances of the event. And yet Oliver Cowdery remarked in 1848 about his attendance at the restoration of the Melchizedek Priesthood: "I was also present with Joseph when the higher or Melchizedek Priesthood was conferred by the holy angel on high. This Priesthood, we then conferred on each other by the will and commandment of God" (recorded by Bishop Reuben Miller and quoted in History of the Church, Vol. 1, p. 40 footnote). Despite Joseph's 1838 claim that three angelic personage, Peter, James, and John, had come, why did Oliver refer to only one being: "the" holy angel? The information that is available about the Melchizedek restoration …creates a problem. Many LDS scholars who have studied the event place the ordination within a few weeks of the Aaronic priesthood ordination date, which was in May 1829 (Encyclopedia of Mormonism, 2:885-86). There is a brief mention of the event in Oliver B. Huntington's journal, which places the Melchizedek ordination on a night after Joseph and Oliver had been on trial in Colesville, New York (Journal of Oliver B. Huntington, 13 January 1881). Joseph Smith dated this incarceration in mid-to-late June of 1830 (History of the Church 1:84-85, 92-94). Wesley Walters located the court bill for this trial, which was dated "July 1st 1830" (Joseph Smith's Bainbridge, N.Y., Court Trials, p.125). That date is several weeks after the Church was organized. But LDS sources are emphatic that Smith could not have legally organized the Church unless he had received the Melchizedek priesthood first. That creates an irreconcilable problem for the LDS claim of authority. Lane Thuet, "Priesthood Restored or Retrofit?" March 29, 2010. If Joseph Smith and Oliver Cowdery received the personal visits of the ancient apostles and received the priesthood under their hands (2 of the men being resurrected angels, and the other a translated being who'd remained on the earth since the days of Christ, per D&C 7), wouldn't they have written the experience down soon thereafter? Wouldn't they have been able to remember the date, or at least the month, or the year of the miraculous experience? Would Oliver have mistaken the three authorized beings for "the holy angel on high" in his re-telling of the story in 1848, if it had been a literal conferral of authority by three holy, flesh-and-bones beings? Joseph Smith claimed in his 1838 History of the Church that the reason he and Oliver had not told members earlier about the "circumstances of having received the Priesthood and [their] having been baptized" was "owing to a spirit of persecution which had already manifested itself in the neighborhood." Is that a plausible explanation? Couldn't they have just kept the incidents quiet when in the proximity of hostile locals while concurrently speaking openly of the events to family and members? Couldn't they, at the very least, have centered their teachings around the authority of the higher and lower priesthoods rather than around the authority originating out of one's desire to serve God? How much stranger or damning would revealing this be than what had already been shared about other things? 3. Joseph Smith and other early members stated that the first conferral of the Melchizedek Priesthood happened in June 1831 in Ohio at a conference of Elders, and that Joseph himself was ordained to the High Priesthood by Church Elder Lyman Wight at that time. It appears from historical records that before 1831, specific males in the church were called to "church offices—elders, priests, and teachers—given authority, and licensed without reference to a bestowal of priesthood" (Rough Stone Rolling, Richard Lyman Bushman, pp. 157-158). Even at the April 1830 meeting in which the church was formally organized, Joseph Smith ordained Oliver Cowdery as "elder" and then Cowdery ordained Joseph as "elder," with no mention made of these ordinations being tied to "priesthood" authority. History of the Church, Vol. 1, pp. 175-176. That elders were being ordained to the "high priesthood" for the "first time" indicates that the office of elder as originally conceived/ordained in the Church had nothing to do with "priesthood." That Joseph received the high priesthood himself under the hand of Lyman Wight (Rough Stone Rolling, Richard Bushman, p. 158) indicates that he did not believe he had received the high priesthood before that time (1831). What does that say about the alleged visit of Peter, James, and John? Since there are only two divisions of the priesthoods in the church—the lesser (Aaronic) and higher (Melchizedek)—the "high priesthood" which the elders conferred upon each other in that conference of elders must have been the latter of the two. It is interesting to note that some of the elders would have conferred the high priesthood on others before they themselves had the high priesthood conferred upon them. A similar thing had happened when Joseph Smith baptized Oliver Cowdery before Joseph himself had been baptized. Likewise, Joseph ordained Oliver as "Elder" before Joseph himself had been ordained as "Elder." Apparently, the individual's heart-felt desire to be baptized or to serve were more important than the rightful authority of the one officiating the ordinance. If Joseph Smith received a conferral of the higher priesthood of Melchizedek from Peter, James, and John in 1829, why did he feel the need to be ordained again to the "high priesthood" two years later under the hands of Lyman Wight? If Peter, James, and John conferred the Melchizedek priesthood on Joseph Smith and Oliver Cowdery in 1829, why did Joseph and others say in 1831 that the first conferral of the high priesthood was in 1831? If many of the church's elders or apostles (the terms were used almost synonymously at first) had already been called and set apart in 1829 and 1830, why would they need to receive the "high" priesthood in 1831? If this was the "first conferral of the high priesthood" in the church (as Joseph and others wrote in their diaries), did the church organize without the Melchizedek Priesthood on April 6, 1830? By what authority did Joseph organize the Church on that date? 4. Joseph Smith and Oliver Cowdery changed the wording of earlier revelations when they compiled the 1835 D&C, adding verses about the appearances of John the Baptist and Peter, James, and John as if those appearances were mentioned in the earlier revelations, which they weren't. Book of Commandments Chapter 28 was originally a 193-word revelation explaining what could be consumed for the sacramental wine. The heading to Section 27 of the D&C states that "In preparation for a religious service at which the sacrament of bread and wine was to be administered, Joseph set out to procure wine for the occasion. He was met by a heavenly messenger and received this revelation, a portion of which was written at the time, and the remainder in the September following." In 1835, Smith and Cowdery added 456 additional verses to that chapter! Did a heavenly messenger really state all 649 words originally, which Joseph failed to include in the Book of Commandments but then he miraculously remembered a few years later, or did Joseph take liberties with the text for his own purposes? 5 …marvel not, for the hour cometh that I will drink of the fruit of the vine with you on the earth, and with Moroni . . .
7 And also John . . .
13 Unto whom I have committed the keys of my kingdom . . .
D&C 27:5-13. See A side-by-side comparison of BofC 28 and D&C 27 or just the BofC Ch. 28 from the Joseph Smith Papers website. It was convenient for Joseph to now have a revelation mentioning the priesthood restoration events, making the priesthood restoration claims seem smooth and coherent. A revelation on church government (known as "The Articles and Covenants of the Church of Christ"), which Oliver Cowdery scribed in the second half of 1829, appeared as Chapter 24 in the Book of Commandments. In it there was no mention of either division of the priesthood (History of the Church 1:64-70). For the 1835 D&C, Smith revised the document by adding the wording of the sacrament prayers, altering the wording of the baptism prayer, and including anachronistic references to "high priesthood" and "high priests" in the church (D&C 20:67. See A Comparison of BofC 24 and D&C 20). The revelations in the Book of Commandments up to June, 1829, were given through the 'stone,' through which the Book of Mormon was translated …[The] revelations … were printed in the Book of Commandments correctly… just exactly as they were arranged by Brother Joseph and the others. And when the Book of Commandments was printed, Joseph and the church received it as being printed correctly …When it became generally known that these important changes had been made in the Book of Doctrine and Covenants, many of the brethren objected seriously to it, but they did not want to say much for the sake of peace, as it was Brother Joseph and the leaders who did it. The majority of the members – poor weak souls – thought that anything Brother Joseph would do must be all right; so in their blindness of heart, trusting in an arm of flesh, they looked over it and were led into error. Is it possible that the minds of men can be so blinded as to believe that God would give these revelations – command them to print them in His Book of Commandments – and then afterwards command them to change and add to them some words which change the meaning entirely? As if God had changed his mind entirely after giving his word? Is it possible that man who pretends to any spirituality would believe that God would work in such a manner? In some instances, when a new revelation changed or updated what had previously been received, the Prophet edited the earlier written revelation to reflect the new understanding. Thus, as his doctrinal knowledge clarified and expanded, so did the recorded revelations. They were characterized by the changing nature of his understanding of the sacred subject matter. The Prophet did not believe that revelations, once recorded, could not be changed by further revelation. He revised his own revelations, adding new material and splicing one to another, altering the wording as he saw fit.He felt authorized to expand the revelations as his understanding expanded . . .Joseph once said that Methodists 'have creeds which a man must believe or be kicked out of the church. I want the liberty to believe as I please, it feels so good not to be trammeled. 'Revelation meant freedom to Joseph, freedom to expand his mind through time and space, seeking truth wherever it might be …The balance between freedom and control makes it difficult to keep Mormonism in focus.Was it authoritarian or anarchic, disciplined or unbound?The printed word of God constituted a doctrinal authority that at the same time was open-ended, allowing visionary freedom to Joseph's successors after his death. Richard Bushman, Rough Stone Rolling, 285. Joseph wanted it all: to be able to claim revelation from God in a trance-like moment, and to later alter such revelations according to "new" theological understanding. As evidenced by his earliest revelations, he began the Church with no understanding of the need for a laying-on-of-hands conferral of authority from ancient prophets in order to proclaim the gospel and baptize for the remission of sins. His ideas on priesthood conferral and the two distinct divisions of the priesthood evolved over time, as did his "revelations." Not until March 1835 did he write plainly of the "Melchizedek Priesthood" and the "Aaronic Priesthood" (D&C 107). Was Joseph Smith justified in making changes to earlier revelations? Do the "new" (1835) references to the appearances of the ancient prophets provide evidence that the priesthood restoration events actually took place? If John appeared in 1829 to restore the Aaronic Priesthood, and Peter, James, and John appeared sometime thereafter to restore the Melchizedek Priesthood, why didn't Joseph Smith use these terms in the Church for 5 years? Will our salvation depend upon trusting the authority of a man who felt at liberty to quietly change revelations he'd formerly "received" from God? Why doesn't the church inform members of the changes Joseph Smith made to his revelations? Is it possible the priesthood restoration events were not literal, given the many problematic details surrounding those claims? If Joseph Smith and Oliver Cowdery did not receive a conferral of the priesthood from the ancient apostles, was their authority to act in the name of God unique? Is the Church of Jesus Christ of Latter-day Saints the "only true and living church" on the earth? Is the church's "Priesthood" real? Joseph and Oliver recording in detail the date/location of the two glorious events very soon after those experiences. They should have been recorded in the Book of Commandments which later became the D&C. Family members and early converts excitedly telling their acquaintances about the visits of the ancient apostles and their conferral of priesthood authority upon the church's founders, Joseph and Oliver. Joseph and Oliver mentioning the angelic bestowal of priesthood authority at the organization of the church (April 6, 1830), since the restoration of the two priesthoods was what made the establishment of a new Christian church with unique authority possible and necessary, per current church literature (see Preach my Gospel, p. 37). Missionaries preaching of the restoration of priesthood authority by the laying on of hands, rather than the authority and calling that come from God to individuals desirous to serve, preach, and heal by the power of spiritual gifts. Early revelations referring to the events and using the same terminology which the apostlesused when restoring the two priesthoods: "confer," "Priesthood of Aaron," "Aaronic Priesthood," "Priesthood of Melchizedek," "keys," etc. (see JS-H 1:68-72). Priesthood quorums being organized per the divisions of the two priesthoods soon after the restoration events. Many members may be interested to know that women in the early restored church may have had some form of the priesthood. Michael Quinn discusses this in the book Women and Authority: Re-emerging Mormon Feminism. Description: When Joseph Smith and Oliver Cowdery announced in the mid-1830s that they had been ordained by John the Baptist in May 1829 and subsequently by ancient apostles Peter, James, and John, it was a surprising disclosure—even for those who had been followers from the beginning. My purpose here is to discuss Joseph Smith's original authority claims, to reconstruct key changes, and to suggest why the stories of angelic ordination were introduced. Editor Comment: Dan Vogel did a great job in this two-part video discussing the priesthood restoration. He covers many areas not addressed by MormonThink. Please watch Dan's video to get a more complete review of this issue. On the sequential steps of the restoration of the priesthood. On the use of the term "priesthood" in the early days of the church. On whether the Aaronic Priesthood was necessary for Joseph and Oliver to baptize each other on May 15, 1829. On whether the conferral of the "high priesthood" for the "first time" really meant the first ordinations of men to the office of "high priest." On the delay in recounting the restoration events. 1.On the sequential steps of the restoration of the priesthood. How came these Apostles, these Seventies, these High Priests, and all this organization we now enjoy? It came by revelation. Father Cahoon, who lately died in your neighbourhood, was one of the first men ordained to the office of High Priest in this kingdom. In the year 1831 the Prophet Joseph went to Ohio. He left the State of New York on the last of April, if my memory serves me, and arrived in Kirtland sometime in May. They held a General Conference, which was the first General Conference ever called or held in Ohio. Joseph then received a revelation, and ordained High Priests. You read in the Book of Doctrine and Covenants how he received the Priesthood in the first place. It is there stated how Joseph received the Aaronic Priesthood. John the Baptist came to Joseph Smith and Oliver Cowdery. When a person passes behind the vail, he can only officiate in the spirit-world; but when he is resurrected he officiates as a resurrected being, and not as a mortal being. You read in the revelation that Joseph was ordained, as it is written. When he received the Melchisedek Priesthood, he had another revelation. Peter, James, and John came to him. You can read the revelation at your leisure. When he received this revelation in Kirtland, the Lord revealed to him that he should begin and ordain High Priests; and he then ordained quite a number, all whose names I do not now recollect; but Lyman Wight was one; Fathers Cahoon and Morley, John Murdock, Sidney Rigdon, and others were also then ordained. These were the first that were ordained to this office in the Church. I relate this to show you how Joseph proceeded step by step in organizing the Church. At that time  there were no Seventies nor Twelve Apostles. That the restoration of the Melchizedek Priesthood took place as a prerequisite to the reestablishment of Christ's Church upon the earth is attested in scripture and in the history of the Latter-day Saints. The priesthood thus conferred by holy Apostles Peter, James, and John embraced all of the offices of the priesthood from higher to lesser. The keys of presidency contained within the apostleship conveyed on that occasion represented the highest authority conferred upon men in the flesh. By virtue of these keys of priesthood, the Prophet Joseph Smith proceeded to ordain and set in order the various quorums as they are known in the Church today. Year 1829: There is a manuscript in Oliver Cowdery's handwriting recording part of D&C 18: saying, "Written in the year of our Lord & Saviour 1829." June 1829: In D&C 18:9 we read "And now, Oliver Cowdery, I speak unto you, and also unto David Whitmer, by the way of commandment; for, behold, I command all men everywhere to repent, and I speak unto you, even as unto Paul mine apostle, for you are called even with that same calling with which he was called." Before June 14, 1829: Oliver Cowdery wrote a letter to Hyrum Smith. The letter has some wording that quotes and refers to section 18 in the D&C. Joseph Smith said that he, Emma, Oliver and David Whitmer traveled to the home of Peter Whitmer Sr. "In the beginning of the month of June. "David Whitmer is quoted as saying "The translation at my father's farm, Fayette Township, Seneca County, New York occupied about one month, that is from June 1, to July 1, 1829." If those dates are exact then the Prophet was in New York during the entire month of June. Just because Joseph and Oliver claimed to have received the visits of the ancient apostles and put references to those events in the Doctrine and Covenants, does that make it so? 2.On the use of the term "priesthood" in the early days of the church. In the restored Church, we often identify the term "priesthood" as "the authority to act in the name of God." This accurately describes its function, but the dictionary meaning of the term is "the office of priest," and that is precisely how it was used in Joseph Smith's day. Thus, in early Latter-day Saint records, including the Doctrine and Covenants and Book of Commandments, "Aaronic priesthood" or "lesser priesthood" referred to the office of priest of the Aaronic order, while "Melchizedek priesthood" or "high(er) priesthood" referred to the office of priest of the Melchizedek order. This is especially clear when one looks at earlier versions of the history (e.g., Times and Seasons and manuscripts) and revelations, which indicate that so-and-so was ordained "to the high priesthood," which was later changed to read "to the office of high priest" or "as a high priest." In Joseph Smith's day, deacons and teachers were not considered to hold the "Aaronic priesthood," nor were elders considered to hold the "Melchizedek priesthood. "Rather, as we read in D&C 84:29-30, "the offices of elder and bishop are necessary appendages belonging unto the high priesthood. And again, the offices of teacher and deacon are necessary appendages belonging to the lesser priesthood, which priesthood was confirmed upon Aaron and his sons." As time went by, terms like "Melchizedek or high(er) priesthood" and "Aaronic or lesser priesthood" came to be used as generalized terms to cover other offices as well. There is no problem with using the terms that way today, but when we read earlier documents, we must remember that they were often used differently in the early days of the Church. In the restored Church, the term "priesthood," in the sense of a generic authority from God, came to replace the term "holy order" used in that sense in the Book of Mormon. Lehi's son Jacob noted that he had "been called of God, and ordained after the manner of his holy order" (2 Nephi 6:2). Alma2 is said to bear "the high priesthood of the holy order of God" (see also Alma 5:54; 6:8; 7:22; 8:4; 43:2). He noted that, in ancient times, "the Lord God ordained priests, after his holy order, which was after the order of his Son" (Alma 13:1, 6-11, 18; see also Ether 12:10). The sons of Alma2 and Mosiah also "had been ordained by the holy order of God" (Alma 49:30). The term was also employed in the early years of the restoration (D&C 77:11),but was gradually replaced by the term "priesthood. "The history kept by Church historian John Whitmer, describing the ordination of the first high priests in June 1831, says that Joseph Smith "laid his hands upon Lyman Wight and ordained him to the High Priesthood (i.e. ordained him a High Priest), after the holy order of God" (History of the Church 1:176, note). The words in parentheses were added by B. H. Roberts when he edited the history for publication, and were necessitated by the fact that the use of the term "high priesthood" to denote the office of high priest had changed by his time. The historical evolution of the terms "Melchizedek priesthood" and "Aaronic priesthood" are comparable to the evolution of other terms in Church history. For example, while today the term "ward" denotes an ecclesiastical unit within a "stake," the earliest use of the term "ward" (in Nauvoo) was for geographical regions of a city, with a bishop in charge of welfare and Aaronic priesthood issues within his ward. Languages are continually changing and terms often take on new meanings. When I was a young man, the term "gay" meant "happy," and "make love" did not have a sexual connotation. We cannot turn back the clock on terms used differently by earlier generations, but we can try to learn what those terms meant to our predecessors. (John A. Tvedtnes, "Evolution of the Term "Priesthood" March 29, 2010. 3.On whether the Aaronic Priesthood was necessary for Joseph and Oliver to baptize each other on May 15, 1829. In the aforementioned FAIR article, the author asserts: "Joseph and Oliver Cowdery were told to re-ordain each other to the priesthood after being baptized. This was to follow proper rules of being a member before receiving the priesthood, but in their case they couldn't become members until having the priesthood to baptize each other. 4.On whether the conferral of the "high priesthood" for the "first time" really meant the first ordinations of men to the office of "high priest." The concept of higher or lower office did not exist until 1831.Thereafter elder, priest, and teacher became offices of descending authority.At a June 1831 conference Smith announced there was a "high priesthood," which for thefirst time implicitly gave all previous church authority and ordination lesser stature.Smith gave no administrative definitions of "high priesthood" but said "that the order of the Highpriesthood [sic] is that they have power given them to seal up the Saints unto eternal life" (Joseph Smith statement, 25 Oct. 131, Cannon and Cook, Far West Record, 20) …A recent interpreter [Gregory A. Prince] has noted that previously ordained elders received the "high priesthood" at the June 1831 conference but not the office of high priest.He suggests that the official history retroactively assigned the later office to 1831.In that respect, it is true that until April 1832 the original minutes continued to list men as "elders" despite their ordination to the "high priesthood. Book of Mormon scribe Oliver Cowdery, who recorded the minutes about the "high priesthood" in 1831, did not use the term "high priest" or "office of high priest" because he was following the Book of Mormon's equation of "high priesthood" with the office of high priest.In fact, everyone in 1831 would have understood that Sidney Rigdon even spoke "to those who were ordained to the Highpriesthood [sic] last evening …[about] their indifference to be ordained to that office …setting forth the power of that office" (Sidney Rigdon statement, 26 Oct. 1831,Cannon and Cook, Far West Record, 26, qtd in The Mormon Hierarchy, 29). But he comments in footnote 5, "A careful study needs to be made of how the early brethren understood the High Priesthood or high priest and the relationship of these terms to the Melchizedek Priesthood—whether these expressions represented a different order of the priesthood or an office within the Melchizedek Priesthood." 5.On the delay in recounting the restoration events. The critics claim that the visitations of John the Baptist and by Peter, James and John never happened. They cite several good reasons such as no one seemed to know about them until years afterward, they were not recorded in the Book of Commandments, which was precursor to the D&C and that some records show that church members had the 'higher' priesthood before the visitation could have even happened. Some claim that, along with the First Vision, these events were invented by Joseph Smith after the church was established to boost his credibility during a time of crisis. The critics might say another explanation on the changing the text of revelations is that the revelations were false to begin with. Joseph Smith claimed that one test of a false revelation was that it contradicted a previous revelation (Teachings of the Prophet Joseph Smith, p.214-215, History of the Church 4:580-581). We also find it problematic that there is no evidence for Joseph telling anyone, even his family, about these angelic visitations. There is much evidence that he told everyone about the Angel Moroni visit but why are the Priesthood Visitations of John the Baptist and by Peter, James and John kept out of the history books for some years after the events supposedly took place? Also problematic is Oliver Cowdery referring to the three messengers as a solitary figure 'the holy angel' when he was supposedly there and would know that there were three 'angels'. And why is there no account of Oliver Cowdery telling anyone about the visitations until years afterward? You would think that two of the most important events in the church history would be very clear and straightforward. As pro-LDS historian Richard Bushman acknowledges in his landmark biography on Joseph Smith (Rough Stone Rolling, 75): "the late appearance of these accounts raises the possibility of later fabrication"—even though he doesn't draw that conclusion himself. Many thinking Mormons do raise that possibility, however. The actuality of those angelic events and the exclusivity of power/authority which such events would denote, are questionable and must be taken solely on faith if they are to be believed due to the issues cited above.